On a cold & windy afternoon at the Olympic Park yesterday, the London Mayoral candidates from the main parties – Labour,Conservative, Lib Dem, Green & UKIP – discussed their policies around technology and presented their “vision” for London’s digital future. Prior to the event one of the organizers, Tech London Advocates, a private sector led coalition of over 2,000 expert individuals from the tech sector and broader community lead by Russ Shaw, had published an impressive manifesto describing the main challenges London currently faces and offering proposed solutions to tackle these issues. I think the desired intent of this manifesto was for the candidates to take on board these proposals and offer their views/responses. However it soon became clear that few had actually read the manifesto at all. The party candidates each kicked off main proceedings with a five minute speech outlining their overall vision for London’s digital future, none of which struck me as being particularly inspiring. The UKIP candidate included in the lineup provided the event’s entertainment & LOLZ by playing the role of “pantomime villain”. His introductory speech could be summarized as “European regulations are very bad! Bad bad bad!” repeated over and over again – without any mention of the technology sector or any issues at all. This was followed by questions from the public. Speaking to other attendees after the event, nearly everyone was in agreement that none of the candidates stood out. 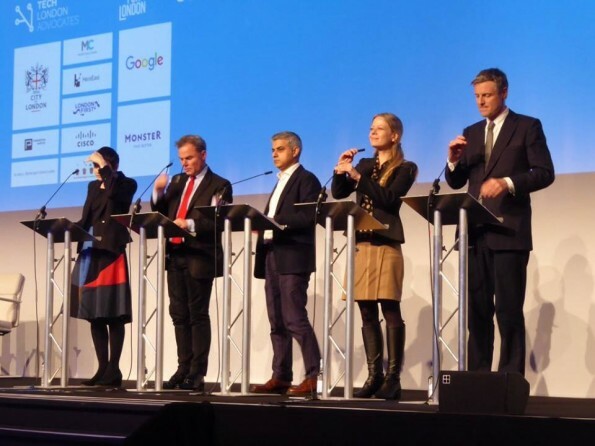 An interesting remark one chap made was that all the candidates reluctantly (they were addressing a tech crowd) proclaimed themselves “anti-uber” – giving coy reasons as to why – with the most likely explanation being that they didn’t want to loose the vote from the black cab drivers & their powerful lobby group. I doubt the reason is that simple: there are more Uber drivers than cabbies. 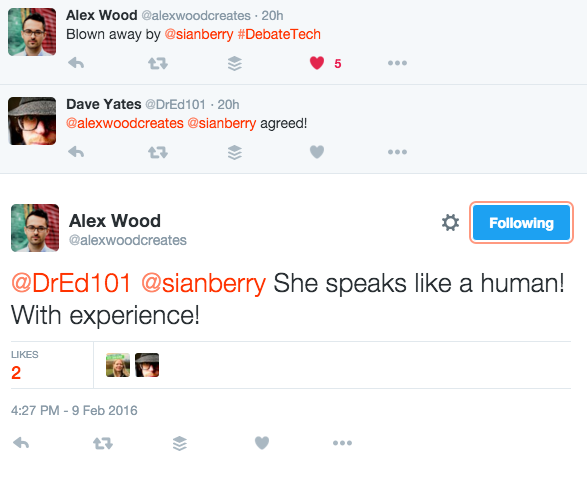 The debate is more nuanced than many people in the tech industry think. Consider the recent reports about Uber & tax, the way they treat regulations, the ongoing complaints about staff conditions (drivers recently went on strike in the US), and wider concerns about the concentration of power in a global platform or the eventual automation of the service through automated cars. I do get surprised at how often people think Uber, a $62.5bn business in its last funding round, are the underdog. They give good service to passengers but they also have very good PR! We need to get that good service into all taxis but look past the PR to see the bigger picture about taxi services. On the flip side, many say that black cab drivers have a much stronger lobby group, as explained on Fortune. The arguments made are reflected in the UK. In my personal opinion, I think that simply protecting antiquated practices/industries that the candidates suggested is a shortsighted approach. 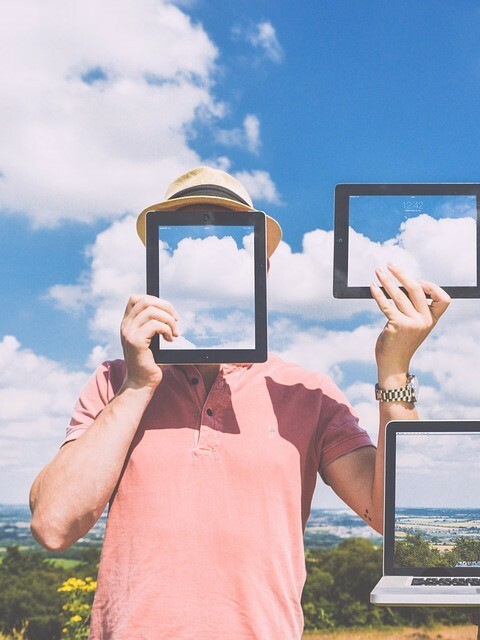 The challenges posed need new solutions, not old ones. They should have spoken more about Cyber Security. It’s a biggie and definitely more should have been said on the IP Bill…. It was too light especially given the audience. Francesca Woodhouse: I haven’t changed my mind about who to vote for to be honest. It’s a tall order to be a tech expert when you are a political candidate but accepting the (albeit very good!) manifesto wholesale & not calling anything out was a bit mediocre! 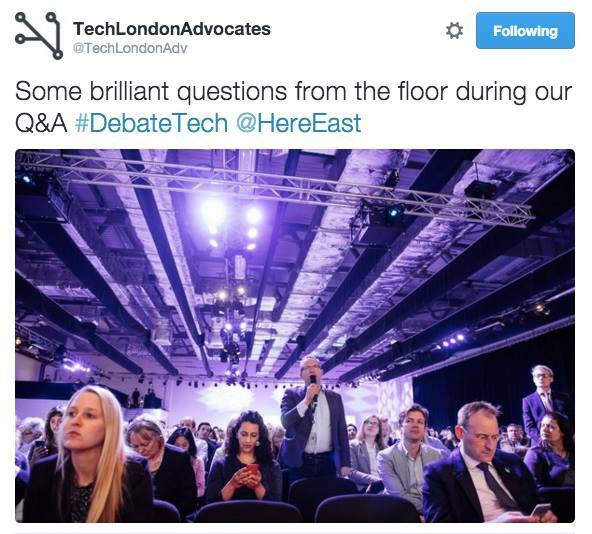 One last thing to consider was what one Tech London Advocate member pointed out: it was hard to spot anyone at the event who was actually a ‘technologist’ i.e. a programmer or coder. The reason? 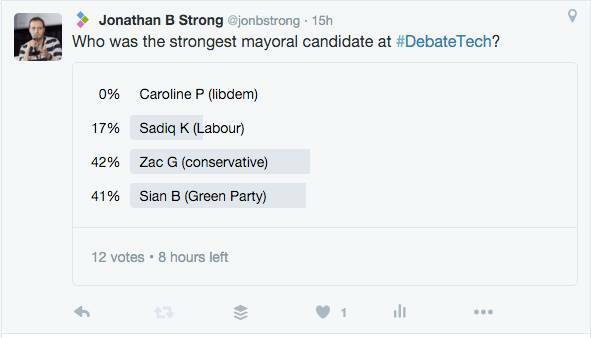 However it’s clear all the candidates have a long way to go to really convey a vision of London’s “digital future” – compelling enough to engage and get the tech community behind them.